A highly relevant question in the discussion on the energy development of EA concerns the relationship that will materialise between RE and the abundant NG resources that are undergoing production in the region. Already in previous chapters it was evidenced that a configuration of RE-NG complementarity could become the least-cost and most sustainable pathway: (1) to guarantee a full electrification of EA; (2) to match the steeply growing demand for power to feed an emerging industrial sector; and (3) to contribute to the objective of clean cooking. In particular, gas could indeed contribute to the displacement of coal in electricity generation, and thus allow for substantial potential greenhouse gas emissions’ reductions. 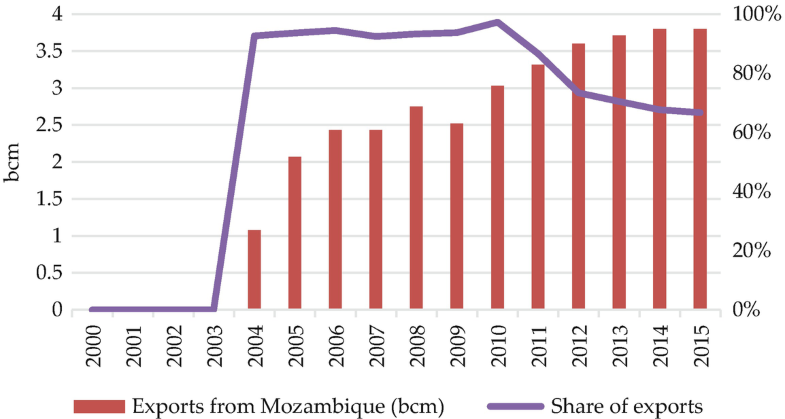 Reserves are concentrated along the coasts of Mozambique and Tanzania, and they are estimated in the two countries at 2832 bcm and 1614 bcm, respectively. 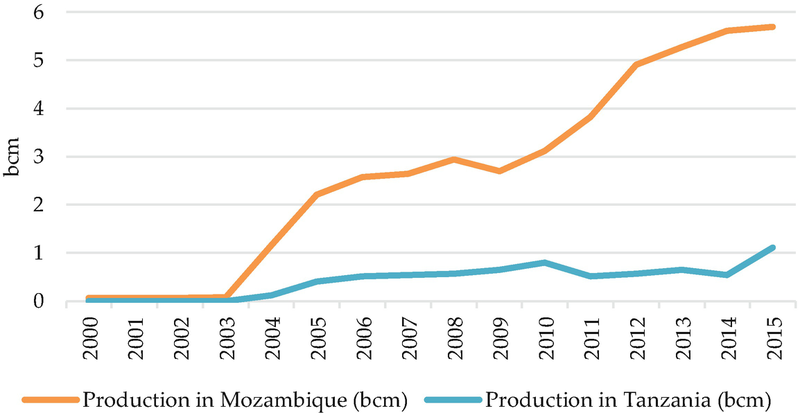 Extraction has begun in the 2000s, and it has reached a total of 6.80 bcm in year 2015 (Fig. 6.1), with the bulk of it produced in Mozambique. At the same time, development of LNG liquefaction units is undergoing in both countries. As pointed out by Demierre et al. (2015), in Mozambique this move has been a consequence of the government strategy of establishing contracts with international oil and gas majors with the chief aim of achieving a net exporter positions, especially towards the Asian market. As seen in Fig. 6.2, ever since the inception of NG production, Mozambique has been exporting most of it. Conversely, hitherto Tanzania focused on developing gas-to-power plants (with 862 MW of gas-fired capacity added since 2004) to increase domestic generation and diversify its power mix away from hydropower. In this context, a small profit margin for exports due to low international LNG market prices (standing around 7 $/MBTU for European prices (UK NBP) and around 10 $/MBTU for Far East prices (JKM) as of February 2018), as well as increasing domestic energy demand in EA, render a discussion of the role that NG could play within the boundaries of the region particularly relevant. Here, with reference to the least-cost electrification analysis of Chap. 4 and to the technological questions constraining in different ways RE, we focus on the question of the potential complementarity that gas resources could exhibit with the domestic development of RE. The use of NG is still limited in the region as a share of the total primary energy supply (IEA 2017), although gas-to-power gained a relevant share in the generation mix of Tanzania. However, a scenario where in the coming years NG will reach a significant degree of penetration in the regional energy market is deemed possible. This has important implications for RE potential development, as it could either complement it (e.g. providing peak power generation potential to support hydro and solar), or take up a large share of total installed baseload capacity, and hence limit the large-scale deployment of RE sources as the main suppliers of baseload power and set the region to a higher emissions trajectory. A similar concern can also be relevant for an alternative scenario of rising international market prices for NG and LNG, with the disregard of the resource for domestic use and its consequent export. This could have side-effects, such as the employment of gas export revenues for the development of coal-fired baseload power plants and development of domestic and import of foreign coal resources. A third consideration is that excessive (i.e. economically inefficient) rates of RE penetration could be witnessed, for instance as a result of a strong public policy-push. This could result in the displacement of NG and in a shift of the resource on the market for international exports away from EA, even in settings where gas-fired generation would be the least-cost and most cost-effective option. Overall, these issues entail discussing the question of how to embark the regional energy mix on an optimal pathway through infrastructure investment and planning. On the one hand, gas extraction processes and the technology for its distribution and conversion to electricity are well established and highly adaptable to different needs and scales. The greatest benefit of NG is that it does not per se present intermittency issues. Also, the electricity output of gas-fired power plants is relatively easier to ramp-up or down than that for coal-fired steam power plants. This allows prompter and more efficient adjustments of the supply to demand fluctuations and therefore a better complementarity with intermittent renewable sources. Despite being abundant, RE potential (and mostly solar PV and wind power) is in fact limited by a number of technical and economic questions, with the pivotal being intermittency. This depends both on natural cycles such as the day-night alternation or the seasons, and on scarcely predictable climate weather events such as wind speed (the variability of which will also increase with climate change). Furthermore, as discussed in the previous chapter, notwithstanding declining costs, battery technologies for power storage are not yet competitive enough to ensure a continuous coverage of electricity needs through RE only. The issue is further exacerbated by the fact that the electricity demand from different sectors, and in particular in developing economies, can be rather unpredictable at different time scales. Looking at other RE sources, geothermal and hydropower do not present harsh intermittency issues. However, geothermal is not everywhere sufficiently available to satisfy the growing demand for power in EA countries, and even when this is the case (e.g. Kenya), it requires costly explorations to identify sites with potential. Hydropower faces instead issues of a different nature: generation is dependent on stream flows and reservoirs levels, which in turn depend on rain intensity and frequency, as well as on evapotranspiration and on water withdrawals for other uses, such as agriculture, domestic consumption, and industrial uses, while it also presents an international cooperation dimension. Gas is also poly-functional: it can be employed for both electricity and heat generation, or in industrial processes, or in fostering the transport sector in urban areas, as well as to support fertilizer production for agriculture. Overall, the greatest contribution of NG could be in urban areas, which are quickly growing in size and importance in EA (United Nations Population Division 2017) and where the population density is high, and the industry and transport sector require increasingly large energy inputs. This includes the development of a number of gas-fired power plants to support the large-scale deployment of renewables, as well as of an interconnected high-voltage international grid system to compensate temporary country-level imbalances. Both these measures certainly represent positive contributions to the achievement of electricity access security in EA. The coupling of access to electricity objectives with the establishment of a distribution network of energy sources for clean cooking and for the local industry, e.g. LPG tanks for cooking or NG pipelines, deserves attention. Many examples are emerging for the former case, with the Kenyan company KOKO Networks using technology to lower off-pipe fuel distribution costs by launching a network of cloud-connected stations in local shops, where consumers are able to buy modern cooking stoves, with which ethanol fuel is then purchased through a digital billing system in small bundles. In Tanzania, the local KopaGas has also launched a pay-per-use LPG model, allowing customers to use mobile money to pay-off gas and cooking appliances over time, at a cost which is competitive with charcoal market prices. Furthermore, in the proximity of urban areas where gas pipelines are either under construction or planned, pre-paid gas supply and smart metering approaches are gaining relevance, with companies exploring distribution options. A number of issues put nonetheless an upper bound to the likelihood of a scenario of region-wide domestic deployment of NG, and thus go against the hypothesis that gas could extensively displace renewables for baseload generation. First, distribution infrastructure (pipelines) is very capital intensive: there exist distribution constraints to domestic consumption in EA-8, and in particular in rural regions where the distance from the grid is long and the population is scattered in villages of low density. In these rural areas, where currently the bulk of the population is concentrated, renewables already have a strong comparative advantage and are unlikely to be displaced in the future. Financing is undoubtedly an issue: Demierre et al. (2015) estimated the total capital cost of the gas transmission infrastructure in the EA region at approximately $57 billion in their baseline scenario. The collection of such amounts of capital depends largely on the contribution of international development banks (which however today appear reluctant to finance large-scale fossil fuel projects), as well as of private foreign direct investment (FDI). In turn, the latter is related to multiple institutional challenges, not last the establishment of a coordinated plan of regional cooperation and infrastructure sharing. Furthermore, while gas-fired generation is not intermittent per se, it does pose back up concerns for reliability: capacity factors of NG combined cycle plants stand at an average of 50% (US EIA 2017), and thus NG generation requires redundancy to secure a constant supply. 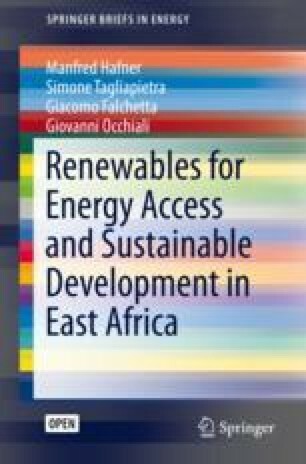 Upon these considerations, we argue that under the current and future forecasted conditions, a diversification of the energy mix is likely to render the power sector of EA more resilient to economic and other exogenous factors, and thus have a positive role in strengthening energy security in EA. Solar and wind power have large technical potential, as well as a guaranteed sustainability in the long-term horizon and large financial support of international development institutions; hydropower is abundant in different countries, but it is likely to be affected by changes in climate patterns (and by intensifying extremes such as flooding and drought events), and it requires temporary water resource withdrawal, potentially determining multi-sector competition. Under a sustainability-oriented and long-sighted governance—gas resources represent an effective match to renewables, as gas could provide a solid back-up to variable REs. Furthermore, an emerging industrial sector needs abundant and secure supply of power and heat to guarantee that the development process takes off. In this sense, hybrid gas-renewable systems like integrated solar combined cycle allow to tap into the increasing combined demand of electricity and heat from industry. Overall, it is important that NG resources in the region support energy development at a low-carbon trajectory. We believe that they have the potential to displace imports of coal and diesel/HFO back-up generation, and thereby help the region to avoid taking a high-carbon energy development pathway and lock-in. Conversely, the domestic development of NG resources should be planned in tight complementarity with RE, given the abundance and the learning that is taking place in the latter sector. Together, RE and NG can represent the bulk of the new capacity additions in the coming years (IEA 2017), and together they can play an important role in complementing the shortcomings of each other, including intermittency and uncertainty in output, while also feeding the productive sectors of the economy and powering urban areas.